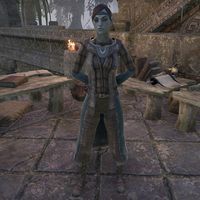 Aarela is a Dunmer member of the Mages Guild and the magister of their local branch in the ruins of Hissmir. She is excited to get her hands dirty with fieldwork. "It's good to see another mage who's not afraid of the outdoors. While other mages dodder around their guild halls, we sleep under the stars and make new discoveries daily. What an adventure!" This page was last modified on 14 February 2019, at 03:08.